A complete set of discrete eigenfunctions obeys the orthonormalization conditions ... . Complementary to these is the set of closure relations ... . For real eigenfunctions, the complex conjugate can be dropped. The finite sums ... for ... up to 100 are evaluated in this Demonstration. Four systems are considered: (1) infinite square-well potential with ... and eigenfunctions ... , ... , ... ; (2) linear harmonic oscillator with ... and ... , ... , ... ; (3) linear rigid rotor for fixed ... , ... , ... , ... , ... ; (4) hydrogen-like radial function with ... , ... , ... , ... . For the first three cases, the sum approaches an oscillatory representation of the delta function ... . However, the hydrogenic functions represent only the discrete bound states. 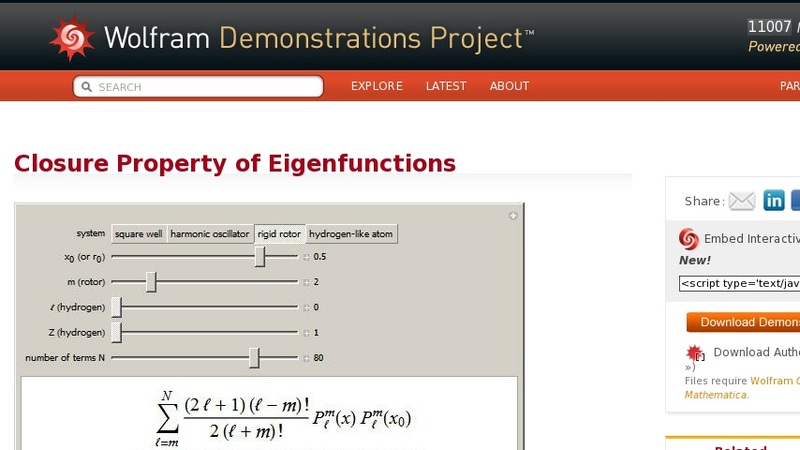 They do not constitute a complete set of eigenfunctions without including the continuum. The sums usually exhibit erratic behavior but sometimes do show a peaking, particularly for larger values of ... .